NEW Rae Dunn "BIG SPOON" spoon rest. 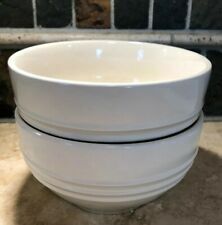 This set of two cereal bowls are in the beautiful neutral "Dune" color. Crown Ducal England FLORENTINE Off White. Dinner Plate 10 1/2" 1 ea. In very good pre owned condition; light signs of use. I got it at an estate sale in Auburn, Alabama. free image hosting. 8 piece set of JI Stonecrest, Andre Ponche Collection, hand painted stoneware dinnerware. Model #230, Venetia. Ivory with brown flowers. Includes four 10 1/2" dinner plates and four 6 7/8" cereal bowls. Rae Dunn Artisan Collection By Magenta. Farmhouse Large Lettering Etched Coffee. New Perfectly Imperfect Rae Dunn! Rae Dunn Collector?. Looking for a specific piece only?. May get hot in Microwave. RAE DUNN by Magenta. DAD'S FAVORITE Coffee Mug. - May get hot in microwave. They are marked dishwasher and microwave safe. These are seriously sturdy & heavy stoneware pieces. These were part of a complete set, and were used. Her stoneware pottery plates and ceramic bowl sets make the perfect creative gifts. She would later give into her clay-driven passions by handcrafting works of art. Rae Dunn Ceramic “Sweats” and “Treats” Plaid Canisters. Minor factory flaw/skip as pictured. Great bowl! Lenox USA PRISCILLA 0380. Set of 3 Bread & Butter Plates 6 1/4". Blue Floral Ivory. Northern Colorado. light signs of use ie may have light utensil marks and or. light cutlery scratches and or light fading;. Sakura Sonoma Oneida Excell Fruit Pattern Platter Round 12.75"
Sakura Sonoma Oneida Excell Fruit Pattern Round Platter 12 3/4". It is like yellow ware, but more of an ivory color. The pitcher is in great, antique condition with lots of crazing that adds a great primitive look. There are three marks on the bottom from where it stood on a stand to dry during the glazing process. STONEWARE NEWCOR STRAWBERRY PATCH 5001 STONEWARE 10 1/2"DINNER PLATES FREE SHIP! VERY PRETTY PLATES. ALL IN EXCELLENT CONDITION. THERE ARE 3 AVAILABLE. Lenox USA PRISCILLA 0380. Set of 2 Dinner Plates 10 3/4". Blue Floral Ivory. Northern Colorado. light signs of use ie may have light utensil marks and or. light cutlery scratches and or light fading;. 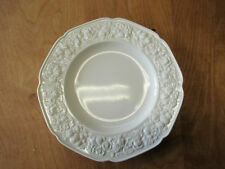 NEW NWT Skyros Isabella Ivory Salad Plate 9.5”. Shipped with USPS Priority Mail. Excellent vintage condition. No flaws noted. Roscher & Co. Vineyard Collection off white 11" pitcher with embossed leaves and grapes in good condition free of chips, cracks or any repairs. Please check my store for more collectibles and rare, hard to find items. Thanks for looking! Tienshan Stoneware- Country Morning -. Dinner Plate(s) -. Red Hearts- Green Leaves. Very Good Condition - Light Use-. Up to 12 Available. The others I saw in that pattern, though, did not appear to have the ridge but looked more like the Corelle where it is just all one level (if that makes sense). The pattern is an off-white or cream color base with large roses in the center and a rim with three larger roses and filled with teeny heart-shaped flowers. This is a lightly used, Pre-owned, 10 in. It was manufactured in 1985 in Japan. High, this item is Model WRJ-2. Fleur De Bois. Chantilly Stoneware. 9" Serving Bowl. Picture shown is item you will receive. HARTSTONE GINGERBREAD PIE PLATE. Great Christmas kitchen decor item or baking plate. This fish shaped stoneware vase is fun to add to a room with nautical decor. Set of 3 Salad Plates 7 3/4". Embossed Rim. Pieces are in very good pre owned condition; light signs of use. I have available here a set of four Arthur Wood Back to Front Lamb Cups,Mugs. The cups are in excellent condition with no chips cracks or crazing. The are 3.5" tall and 3" in diameter they hold approximately 8 ounces. I wrap all items in bubble wrap unless otherwise specified and I use a variety of fillers for the rest of the box. Contact me with any questions. Thank you for viewing my listing. Dishes are my passion! You may also be interested in. Very beautiful used condition. I could not find any fork marks. They look un-used.